Trump’s missile attack on Syria has been largely approved, indicating that America wants to reclaim the international watchdog role. But first, Trump must recover the unity of the United States. The Jews in his administration can help him do just that. In my perspective, Trump’s time in office has proven that he deserves a chance to lead the country, as former Vice President Joe Biden put it last month. Just recently, former Swedish PM, Carl Bildt, mocked the president following Trump’s implication that there was a terror attack in Sweden perpetrated by immigrants. Mr. Bildt tweeted, “Sweden? Terror attack? What has he been smoking?” Two months later, the current Swedish PM declared that Sweden will “never go back” to the days of mass migration after an illegal immigrant killed four people and injured 15 in a truck-ramming attack in downtown Stockholm. After months of derision at Trump’s statements that the Obama administration spied on him and his advisors prior to the election, Bloomberg’s Eli Lake has revealed that Susan Rice, former national security adviser to Barack Obama, did precisely that. Trump must press forward with his agenda and take America to the next level. It means to consolidate, unite, and fuse the American society into a cohesive whole. As president of the United States, this is his primary obligation to his people. Despite what seems to be a systematic campaign of liberal media such as CNN and The New York Times to discredit President Trump, the rifts that he exposed by his very election have been in the making for decades. Trump did not create them, but his election brought them to the surface. The center is quickly shrinking on both sides of the political map. Trump has come to power at the time that the country requires an urgent transformation into a society with a common agenda. The fact that Trump was elected proves that the American people are largely behind him. However, if his actions are not part of an overarching strategy to unify the nation, they will not produce the desired result. The government should not regard problems as isolated crises, but rather as indicators of disunity in society. The mode of work should resemble that of a healthy family: It has to prioritize, yet without leaving family members behind. If Trump comes to view the American people the way a healthy family treats all of its members, there is no doubt America will be great again. 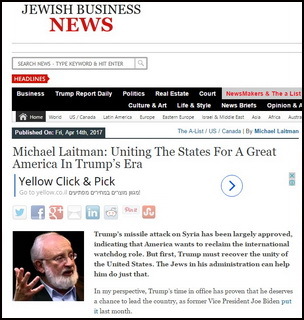 As with any administration in the last several decades, that of Donald Trump is rife with Jews in key positions. Jews are at the top primarily because they are great connectors, making them key figures in the functioning of every system. The problem is that every administration uses Jews in order to promote its own agenda. Trump will set a precedent if he uses them in order to promote an all-American agenda of unity. Everyone will benefit from this. If Jewish advisors in key positions establish trust and mutual responsibility among themselves, it will be much easier for the President to reconcile with the Democratic Party and establish a government that enjoys the full support of Congress. The longer Trump waits, the harder it will be for him to operate. As a smart leader he should ask from his advisors to draw up a roadmap leading from the current partisanship to trust, cooperation, and eventual cohesion of American society and the political establishment. This will make America not only great, but also a role model for all other nations, “a light unto nations,” if you will. Implementing a plan of this nature will reverse the negative global trajectory and will guarantee a better future for our children, and for the generations to come. Democratic values have devolved into a cancer, devouring themselves. Only #UN officials and the like still benefit from them. EU must recognize that peace with immigrants is impossible, then see same is true for #Israel & Palestinians. If antisemitism doesn’t blind. “According to Literarydevices.net, he was talking about ‘living a good and balanced life.’ But he might have been speaking of the latest quirk in marriage ceremonies: The marrying of oneself to … oneself. My Comment: This is said very beautifully. In fact, this emphasizes the basis of human nature—self-love. Man does not love anyone as much as he loves himself. This is absolutely honest, instinctively correct, and occurs naturally. I think only about myself, and no one blames me for that. I only take care of myself, serve only myself, so long as I feel good. This is true narcissism; I was engaged to myself to begin with. This whole situation leads a person to the recognition of his true nature. Therefore, I am in favor of a person claiming, confirming, and admitting that he only loves himself and that he became engaged to himself the moment he was born. He doesn’t need to sign it but simply recognize the fact that he truly dedicates all his time and energy to himself. This is really our nature, and where can we escape from it? Then suddenly he promises to live with, take care of, and think about some person all the time, to think about him. Today we see that love cannot exist. The attraction and living together for most young couples today lasts for about two to five years at the most, and then the marriage falls apart, crumbles, and they cannot take it any longer. We have reached a state where we cannot think of any type of communication other than temporary ones. This is our way of recognizing evil. Human nature needs correction. Within us lies a second hidden part of our nature, which will not allow us to remain in our fraudulent state. Humanity cannot agree with this; it will look for a way out and find it—in correcting itself. Therefore, any awareness of the evil of our nature is a positive process. I hope that we will discover more impulses of humanity and rise to the next level. Baal HaSulam, “The Freedom”: Separation between people is the source of every calamity and misfortune. But with concepts and ideas, it is the complete opposite: Unity and lack of criticism is deemed the source of every failure and hindrance to all the progress and didactic fertilization. … The more contradictions there are between opinions and the more criticism there is, the more the knowledge and wisdom increase and matters become more suitable for examination and clarification…. Thus, evidently, the whole basis of physical success is the measure of unity of the society, and the basis for the success of intelligence and knowledge is the separation and disagreement among them. We have to understand that we argue only because bigger desires are revealed in us, which prevent us from uniting with each other. Consequently, we demand unification above all disagreements. An ordinary connection is possible in a family or among primitive peoples who existed before the Babylonian shattering. In ancient Babylon, many nations used to live as one family and spoke one language. Later on, egoism in us grew even more, each group started fighting again, and we divided further. New fights led to new separations. And so we arrived to the contemporary world where everyone lives for themselves and do not want to see anybody near them. Cell phones and computers—that’s all we need. We want to be left alone in our homes and not to be bothered by anybody. Soon, food will be delivered to us by helicopters, biomass with any taste on demand, so we don’t even need to leave the house. This is Nimrod’s method, which came into being in ancient Babylon and has reached its final manifestation nowadays. There was also the method of Abraham, who taught to unite above all these disagreements. That is, differences in opinion should remain and the more they are revealed the better, the stronger is the connection that could be built. The followers of Abraham, who called themselves the people of Israel, succeeded in reaching the peak of unity called the construction of the First Temple. But they were not able to hold on to it. This was not possible since and they had to go through shattering and disperse among the nations of the world in order to pass to them the willingness to unite. According to the method of Abraham, the disagreements remain but “love covers all transgressions.” Thus, we come to true freedom, when we are free from the rule of the angel of death and rise above it. Specifically due to egoism, we unite with others on an ever higher level. Thanks to unification above disagreements, we start to understand, to feel, to attain the difference between darkness and light, which gives us the sensation of spiritual reality, although we ourselves are completely corporeal. This is the essence of Abraham’s method. There are no other methods but these two: either distance from each other, according the method of Nimrod or unite above differences, according to the method of Abraham. Question: In what way is “we” better than “I”? Is it because there are no problems or feelings in “we” as there are within the limitations of my “I”? Answer: Of course. What is more, when we attain the connection between us, here, now, in this life, we will begin to attain a new existence. Even if the physical body dies, it will not be a hindrance since we will already be living in the next dimension. How Does The Environment Shape Reality? Question: You say that inclusion into others will change the perception of reality. How will it happen? Answer: We constantly talk about this in our daily lessons. In order to sense the upper world we need to build a sensory organ, in other words, a vessel of reception. 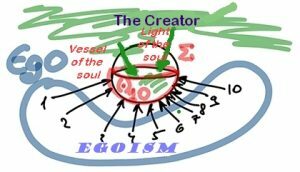 We must build this vessel from the egoistic desires of the ten (ten people) so that it becomes a sum of all our good qualities that are directed toward bestowal and love. To do this, we must rise above ourselves, correctly interacting with each other in order to connect our ten points in the heart. If we succeed, we will turn into the quality of bestowal and love and will become an instrument for reception. Then all the Upper Light that is around will fill us. This upper field will be called the Creator. Therefore, we need to build a vessel of the soul into which the Light of the soul enters. How Is The Upper World Attained? Who Depicts The Picture Of The World To Us? Torah, Deuteronomy 21:10: If you go out to war against your enemies. This is about the war of a person against his nature that is egoism. On one hand, this is a very difficult work, and the Torah describes it very precisely as a war. After all, you must fight with your internal properties, views, thoughts, and with the constant discovery that everything is directed to the benefit of your body, for your own convenience. You always have to rise above this, to prefer the convenience of others, and through them, the convenience of the Creator to your own comfort, because the Creator is the personification of everything that is outside of you. This is a huge war with yourself. Of course, there are forces that help fight and determine how to choose certain methods, opportunities, time, and circumstances in order to somehow rise above yourself and return your thoughts to the actions for the benefit of others and the Creator, and not for your own benefit. But in general, this is a very difficult job. And the most important thing is, that although this work is so difficult in the inner pressure of a person, all people in the world must take it upon themselves. This is the most incredible fact. Such thoughts are typical for those few people in the world who have a point in the heart. They understand the need for attaining the purpose of creation and for fulfilling of its plan. They have a rudiment of a new desire that burns them from within. Ahead, a great fight awaits them. “Go out to war,” as the Torah says. However, they have at least an initial desire for this. For the rest of the people, all of it is in a dormant internal state. Yet, they are the entire humanity less the dozen people who really have a strong need to rise above their nature and are ready for anything. In the end, it will still affect everyone because humanity must rise to a completely new nature, new laws, and new forces.